It’s time for a new Crafty Friends Challenge. 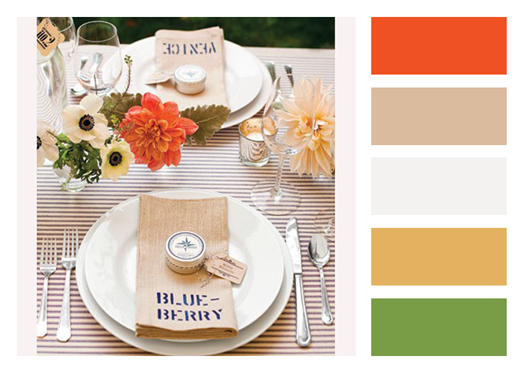 Charmaine is the hostess and her challenge to us is to create a mostly white card, with just a splash of color. I will also enter the card into the current Simon Says Stamp Challenge, which is to use your favorites. Here I used paper piercing, rhinestones, dies, patterned paper and paper piercing. The layout of the card is from the current CASE Study card by Windy Robinson. I started by cutting snowflakes out of silver glimmer paper with one of the Snowflake Borderabilities dies. A 1 3/4″ x 3″ strip of Carta Bella’s Winter Fun patterned paper was adhered to the bottom of a 3″ x 5″ piece of Neenah Solar White cardstock after the edges of the paper were sanded. The bottom edges were rounded and the edges of the layers were paper pierced. Seam Binding was tied around the top of the patterned paper and three bells were tied on with silver cord. The layers were adhered to the card base, a 3 1/4″ x 10 1/2″ piece of Solar White cardstock folded in half with the bottom corners rounded. A sentiment from Simon Says Stamps Small Folded Banners Holiday was stamped in Platinum Stazon on white cardstock. It was cut into banner form. Want2Scrap Rhinestones finish off the card. 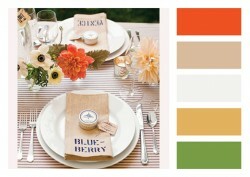 I am the hostess for the new Crafty Friends Challenge. Since I have been on a CAS card kick lately, I thought it would be fun if that was my challenge to do. Create a clean and simple card. I created my card a while ago for a Featured Stamper Challenge on Splitcoaststampers. I started with a 3 1/2″ x 11″ piece of Neenah Solar White cardstock, folded in half. The top right and bottom left corners were rounded and the background stamp from Simon Says Stamp exclusive Music 2 My Ears stamp set was stamped on the left hand side in Key Lime VersaMagic Ink. 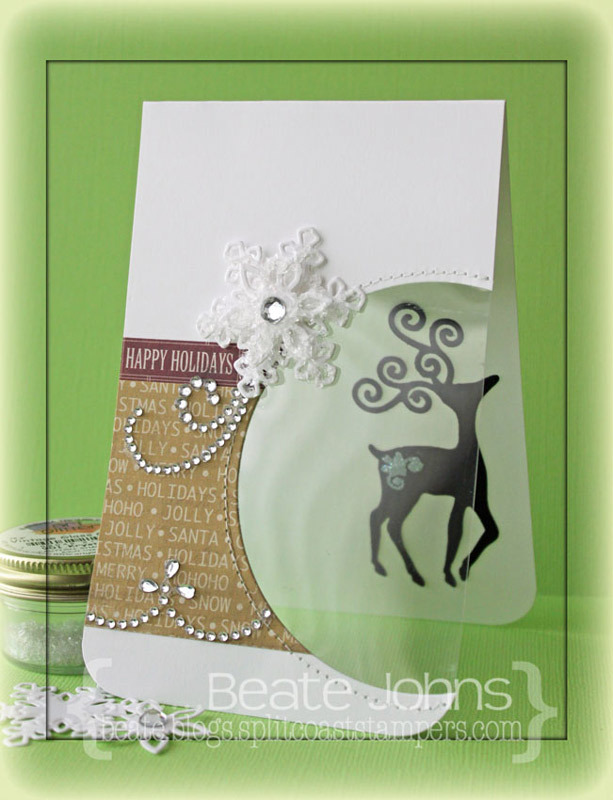 More white cardstock was cut with one of the Holiday Labels dies. Two of the Hexagons were stamped with the snowflake hexagon from the Holiday Labels stamp set in Turquoise Gem VersaMagic Ink, on with the Hexagon outline stamp. The hexagons were adhered over the stamped background. A snowflake was cut out of white cardstock with the Faceted Snowflake die, topped with a button that was tied on with silver cord and adhered to the empty hexagon. Blue Calipso Fourz Bazzill cardstock was cut with the Snowflake Bracket die and adhered to the right hand side next to the Hexagons. A sentiment from the Holiday Label set was stamped in Ocean Depth VersaMagic ink to the lower left corner. 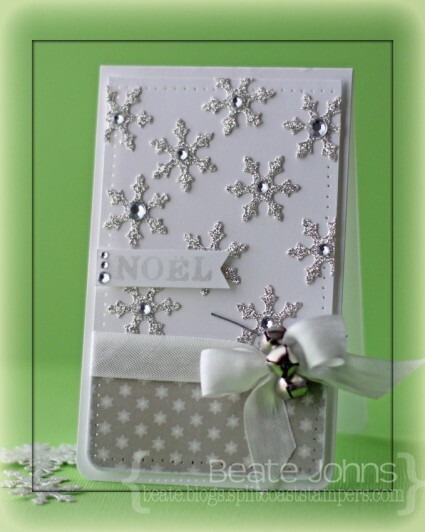 Rhinestones from a Sleek Strips Silver Rhinestone pack finish off the card. Thanks so much for looking! I hope you have time to join us in the challenge. It’s easy and fun! Come back Monday and Tuesday for more CAS inspiration!!! Have a wonderful week! It’s time for another Craft Friends Challenge. This time it’s all about Glitz and Glam. Add some sparkles to your project, anyway you like. For my sample I created a CAS Christmas card. I started with a 3 1/2″ x 11″ piece of Neenah Solar White cardstock. The paper was folded in half and the bottom corners were rounded. Two pieces of Carta Bella Christmas Day Paper were adhered to the lower half of the card. A window was cut with the largest of the Standard Circle (SM) Nestabilities dies at the right edge of the card. Acetate was adhered behind the card front and the edges of the window were stitched. A piece of black cardstock was cut and embossed with the reindeer die from the new Frosty Forms die set from Spellbinders. Moonlight Brilliance ink was used on the embossed piece on it’s back and it was embossed with iridescent ice embossing powder. The reindeer was adhered on the inside of the card on the right, so it could be seen through the partical circle window. A layered snowflake was created by cutting and embossing Solar White cardstock with the two smallest Create-a-Flake 4 dies. The smaller one was adhered to the bigger one with foam adhesive squares. A rhinestone was added in the center of the smaller snowflake and the rest of both snowflakes was covered with Glossy Accents. Vintage Glass Glitter Shards was added over the snowflake and it was adhered to the upper left side of the circle window. Part of a Fancy Waves! Border Bling was adhered to the lower edge of the patterned paper. Part of a Finesse Rhinestone swirl under the snowflake finish off the card. The new Crafty Friends Challenge is super easy. 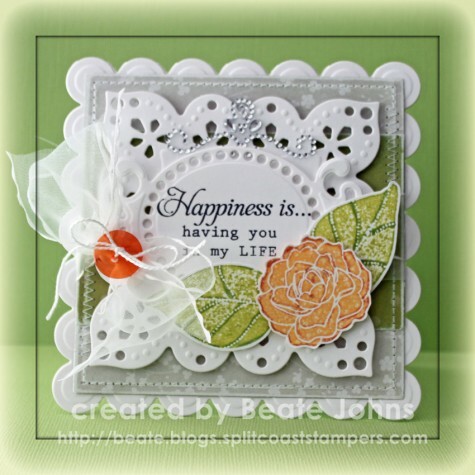 Charmaine is the hostess and she is asking you to incorporate dry embossing into your project. I combined the challenge with yesterday’s Hope You Can Cling to Challenge. I started out by embossing a 3″ x 5″ piece of Neenah Solar White cardstock with the Simplicity M-Bossabilities folder. The bottom right and top left corners were rounded. The layer was stitched to a 3/16″ bigger piece of black cardstock, before it was adhered with foam adhesive squares to the card base, a 3 1/2″ x 11″ piece of textured Kraft cardstock, folded in half. Three butterflies were cut out of My Mind’s Eye Honey patterned paper, topped with rhinestones from a Sleek Strips Silver Rhinestones. Another piece of Honey paper was cut and embossed with a Spellbinders Nested Pennants die. The edges were sanded and stamped with a sentiment of MFT’s Thanks a Bunch Stamp set in Jet Black Archival ink. A flourish was cut out of black cardstock , adhered to the left hand side of the Pennant sentiment strip and topped with a yellow button. 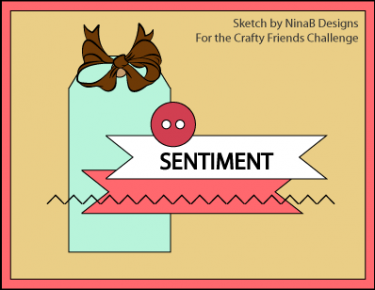 I am excited to be hosting the current Crafty Friend Challenge. Since Halloween is just around the corner the challenge is a theme: Halloween. Anything that you can think of Halloween related. For my sample I filled an old Prima Flower bottle (washed it first, of course) with Candy Corn and made a matching card. My latest order from My Favorite things included Lisa Johnson’s Primitive Pumpkins set. I thought it would be perfect for this challenge. First I decorated the bottle. I started by stamping a background from Well Worn in Jet Black Archival Ink on Kraft cardstock, that had been cut with a die that came with that set. Neenah Solar White cardstock was cut with another Well Worn Die-namics die. A frame from Well Worn set was stamped over it, then a sentiment from Primitive Pumpkins was stamped in it’s center. Three stars from that set were stamped to the label with Pear Tart Memento Ink. 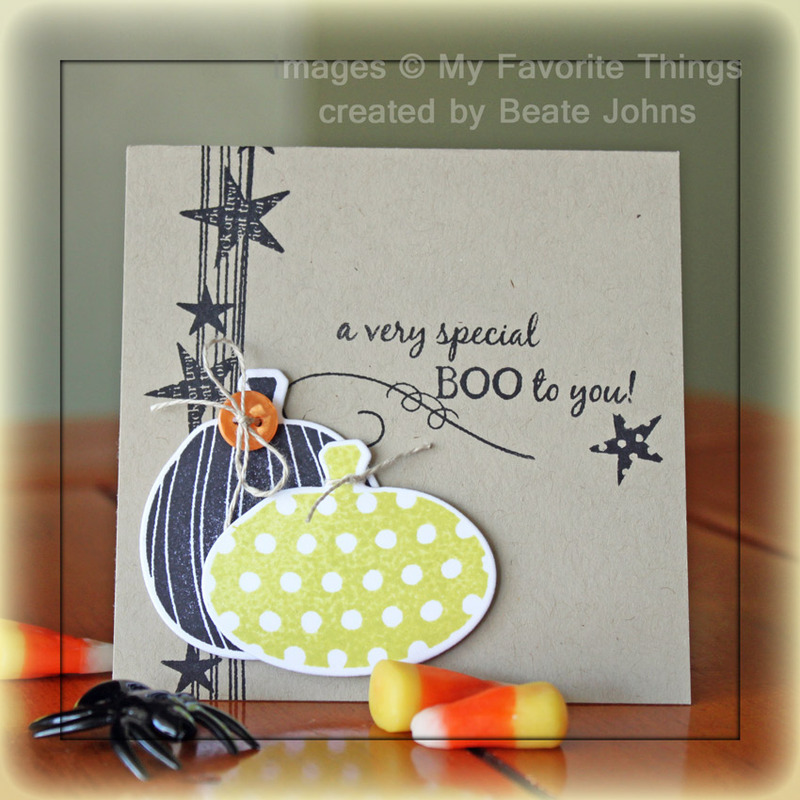 The smallest pumpkin was stamped in Wild Honey Distress Ink on white cardstock, that had been cut with the matching die. A sour apple button was tied on the stem with Linen Thread. The pumpkin was adhered to the label with foam adhesive squares. A small hole was punched on each end of the label and it was tied to the bottle with linen thread, as well as adhered with two foam adhesive squares (to make sure it doesn’t slip). White cardstock was cut with the Notched Tag die and stamped with the border from the Notched Tag stamp set. A sentiment from the Primitive Pumpkins set was stamped in the tag along with some stars. Linen thread was tied on along with a Orange Fizz Button and tied around the neck of the bottle. The card base of the matching card is a 3 1/2″ x 7″ piece of Kraft cardstock, folded in half. the star banner from Primitive Pumpkins was stamped to the left, with a sentiment and swirl on the upper right side with Jet Black Archival ink . The big pumpkin was stamped in black on white cardstock, the medium pumpkin in Pear Tart. Both were cut out and adhered to the card base with foam adhesive squares. Another Orange Fizz button was tied to the big pumpkin and a knot out of Linen thread on the medium pumpkin finish off the card. I hope you have time to participate in the challenge. If we have more then ten entries, I will give away two My Favorite Things sets with matching dies as well as a 6×6 pack. Every challenge entry is an entry for the raffle. I started out by stamping an image from The Craft’s Meow’s Lovely Label 18 in Jet Black Archival Ink on a piece of Echo Park Springtime paper. It was cut and embossed with the 2nd largest Label 18 Nestabilities Nestabilities die. A piece of Neenah Solar White cardstock was cut and embossed with the 3rd smallest of the Standard Circle (lg) Nestabilities dies. It was first stamped with the center of the same Lovely Label 18 die. Next the die was placed back on the cardstock circle and part of the image from Butterfly Kisses was stamped in the center. Another piece of EP Springtime paper was cut and embossed with the third largest of Card Creator Matte B die. The edges were sanded before it was stitched to a slightly bigger piece of black cardstock. Both layers were adhered to piece of white cardstock, cut and embossed with the largest Card Creator Polka Dot die. A piece of Springtime paper and a piece of white cardstock were cut and embossed with two Nested Lacey Pennant dies. The patterned paper was sanded before part of a sentiment from Butterfly kisses was stamped on both. They were adhered next to the image layer, which had been adhered to the left hand side of the Card Creator layers with dimesional adhesive. Part of a Fancy Waves! Border Bling was adhered underneath the patterned paper pennant. The butterfly of the same set was stamped in Dandelion Memento Ink was on white cardstock, cut out and topped with a button. The butterfly was adhered to the image layer on the right hand side. Stardust Stickles was added over the dandelion and the butterfly wings. I was too lazy to cut a card base with the largest Polka dot die, so I made my card base out of a 5 1/2″ x 8 1/2″ piece of white cardstock, folded in half. I added another layer of Springtime paper over the card base, measuring by 4″ x 5 1/4″. I hope you have time to create a card for the challenge! I am so excited we are back. And check out my fellow challenge members gorgeous creations! 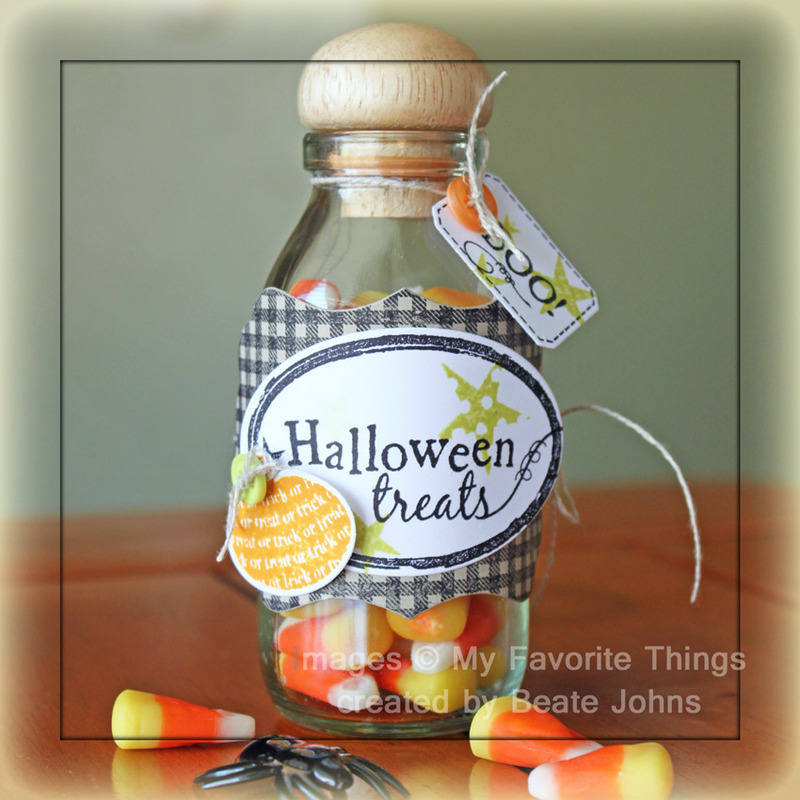 Today is Linda‘s turn to host the Crafty Friends Challenge. Her challenge to us is to use flowers on your projects. Paper flowers, flower stamps or even flowers on patterned paper. I combined today’s challenge with one of the current Moxie Fab World Challenges called Doily and Lace. 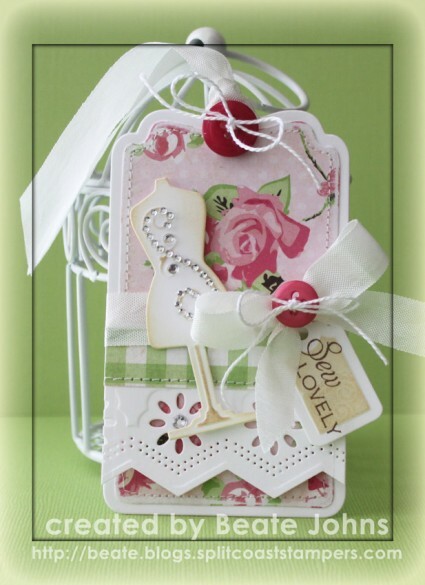 I love the big doily stamp from The Craft’s Meow Simply Delightful stamp set. It was stamped as a background in Cantaloupe Memento ink on a piece of Neenah Solar White cardstock that had been cut and embossed with the second largest Label 25 Nestabilities die. The edges of the label were sponged with the same ink. The flower of Simply Delightful set was stamped in Lady Bug Memento Ink twice on Solar White cardstock. The flowers were cut out, layered and topped with a Rhinestone. The leaf/stem image from that set was stamped in Pear Tart Memento Ink cut out and adhered under the flower. A sentiment was stamped in Tuxedo Black Memento Ink on a piece of white cardstock that had been cut and embossed with a Nested Lacey Pennants die. The sentiment was adhered to the lower right of the label 25 and the flower was adhered slightly over the pennant. The card base is a 3 3/4″ x 11″ piece of white cardstock, folded in half. The bottom two corners were rounded. A 3 1/2″ x 5 1/4″ piece of Echo Park Hello Summer patterned paper was embossed with the Mystic M-Bossabilities folder. The corners were rounded, the embossed part was sanded and the edges were sewn. A hole was punched in the lower half of the label and May Arts ribbon was threaded through. The label was adhered to the paper with dimensional foam and the ribbon was tied into a bow. The patterned paper was adhered to the card base. Parts of a Finesse Rhinestone Swirl and two Leaf Trinket Pins finish off the card. Thanks so much for stopping by! I hope you have time to participate in the challenge. Who doesn’t like flowers, right? Yesterday a new Crafty Friends Challenge was posted. 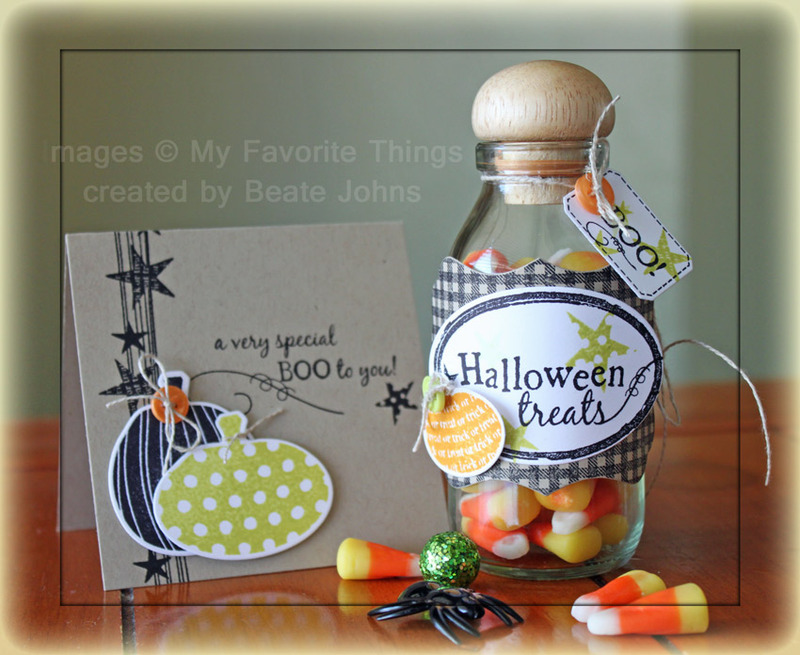 Heather is the hostess for this challenge and her challenge for us is to create anything BUT a card. I decided to create a tag with one of the new Pagemaps dies from the Tags & Flags die pack. The card base was created by cutting and embossing a piece of Neenah Solar White cardstock with one of the tag die from the Pagemaps die pack. A piece of Bazill Basics Paper Vintage Marketplace patterned paper was cut with the same die. The edges were sanded and then it was cut down on the embossed edge. The paper was adhered to the tag base. An insert from Classic Decorative Insert 6 and a cutting edge from Classic Edge One were used to cut and embossed a piece of Neenah Solar White cardstock. It was adhered under a 3/8″ wide strip of another pattern from the Vintage Marketplace paper. The strip was adhered to the tag and the edges were stitched. Seam binding was tied around the upper edge of the horizontal strip. More Solar White cardstock was cut and embossed with the dress from die from Sewing Elements and the rectangle tag die from Home Sweet Home . Both pieces were sponged with Antique Linen Distress Ink. The dress form was adhered to the left hand side of the tag. The tag was stamped with a sentiment from The Craft’s Meow’s Sew Lovely stamp set in Rich Cocoa Memento Ink. The tag was tied on to the bow with embroidery thread and a button. Rhinestones from Silver Baby Bling Rhinestones and a Finesse Rhinestone Swirl finish off the card. Thanks so much for stopping by! Have a wonderful Monday. I really liked how the orange flower in the center popped out of the image and the most of rest of the image. So I started out inking up the solid flower image from The Craft’s Meow Happiness is… with Cantaloupe Memento ink. The edges of the stamp were inked with the Potter’s Clay Marker before the image was stamped on Neenah Solar White cardstock. The leaf of the same set was inked up with Pear Tart Memento Ink and the edges and lines were colored with the Bamboo Leaves Marker before it was stamped. That was repeated before both leaves and the flower were cut out. A sentiment from that same set was stamped Tuxedo Black Memento Ink on Neenah Solar White cardstock that had been cut and embossed with a Fancy Tag 3 die. The tag was adhered to another piece of white cardstock, cut and embossed with the Fair Isle Pennant die. Two pieces of My Mind’s Eye On the Bright Side Two were cut and embossed with a Grand Square Nestabilities die. The edges were sanded and stitched before May Arts ribbon was tied around the layers and through an opening of the sentiment layers. The layers were adhered to the paper layer with dimensional adhesive before they were adhered to the card base, a piece of white cardstock cut and embossed a Grand Scallop Square Nestabilities die. The ribbon bow was topped with a button that was tied on with embroidery thread. A piece of Fancy That! Border bling finishes off my card. I hope you have time to participate in the challenge.